Cherupayar Ularthiyathu is a healthy and tasty side dish for rice or Kanji. 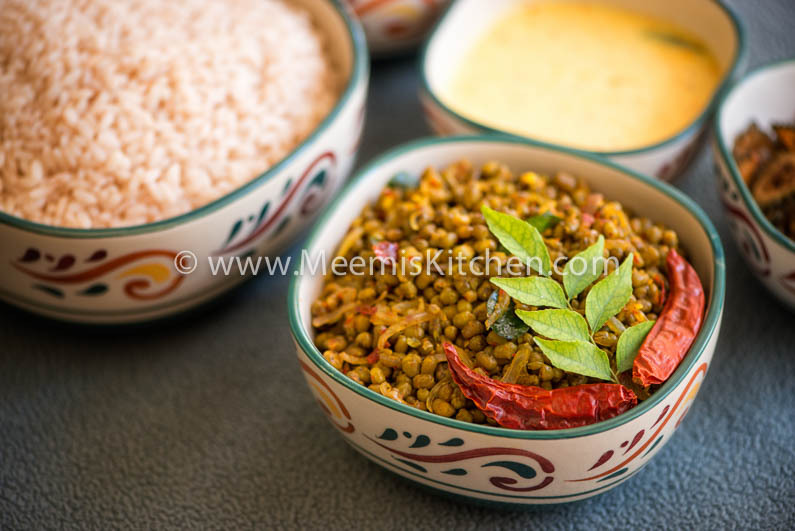 “Cherupayar” or Mung Beans, is a super food loaded with proteins and nutrients. It is prepared in a variety of ways and is great with rice and Rotis/ Chappathis. It is an inevitable item in our menu and everyone in the family loves all the forms of Cheru payar; be it Thoran or fry. Fondly called as “Cherus”, by my Chittappan (uncle), it is a family favorite since ages and so it can be given the apt title “Kudumba curry” (family special curry). Specially dedicating this recipe to my wonderful family members especially, Kachappan. Mung Beans or Cherupayar has great health benefits and is a satiating meal. Cherupayar thoran and Kanji is a very popular combination in Kerala, considered as a traditional favorite to boost your energy levels when you are sick; a comfort food after a tiring travel; a soothing food to cleanse your system. In this Cherupayar Ularthiyathu recipe, Cherupayar is roasted with Chili flakes and pepper. You may also like my other Payar/ Lentil dishes like, Vazhakoombu Cherupayar thoran, Cabbage and cherupayar thoran, Beans Thoran, Vazhakka Cherupayar thoran, Churakka payar erissery, VanPayar Thoran, VanPayar Ularthiyathu etc. Also check for variety vegetable dishes like Vendakka Mezhukkupuratti, Kaya ularthiyathu, Koorkka stir -fry, Achinga Mezhukkupuratti, Kovakka, chena stir -fry, Peechinga thoran, sprouts thoran, kovakka thoran, cabbage Irachi thoran etc. It is a tasty combination dish with rice, Fish curry and Kumbalanga Moru curry. Enjoy!! Soak Cherupayar/ Mung Beans in water for 3 hours or more. Pressure cook with just enough water to cover the lentils (Cherupayar). Heat little coconut oil in a kadai and add curry leaves. Then add the chopped onion and crushed garlic. 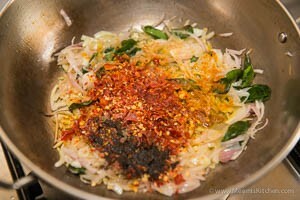 Add Turmeric and Pepper Powder and the Chilly flakes and sauté. Add the cherupayar and salt and mix well. Cherupayar Ularthiyathu is ready. Garlic and Pepper adds wonder to the flavors. Do not add salt while cooking lentils. Add salt while mixing with the spices. Cherupayar/Mung Beans/ Green gram is considered as Vegetarian superfood. It is loaded with vitamins and proteins and is low in carbohydrate.